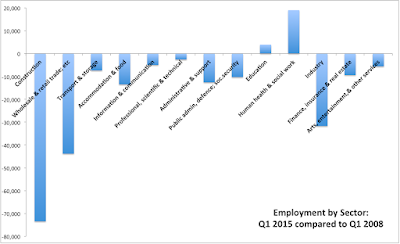 Overall, there were 1,574,800 people employed across all sectors of economy in 1Q 2015, which represents an increase of 2.67% y/y. In 4Q 2014 y/y rise was 2.33%. Current level of employment is 9.9% below 1Q 2008, but since 1Q 2011 (during the tenure of current Government) the economy added some 59,700 jobs - a rate of jobs creation of 14,925 per annum. The rate of jobs creation did accelerate in the last twelve months: between 1Q 2013 and Q1 2014, the economy added 26,800 jobs and between 1Q 2014 and 1Q 2015 it added 41,000 jobs. Nonetheless, compared to 1Q 2008 there were 192,400 fewer workers in the economy at the end of 1Q 2015. Our 'smart' and 'knowledge' economy currently operates at employment levels in Information & Communication sector of some 59,800 (quite low, surprisingly, given the hype about the sector growth). 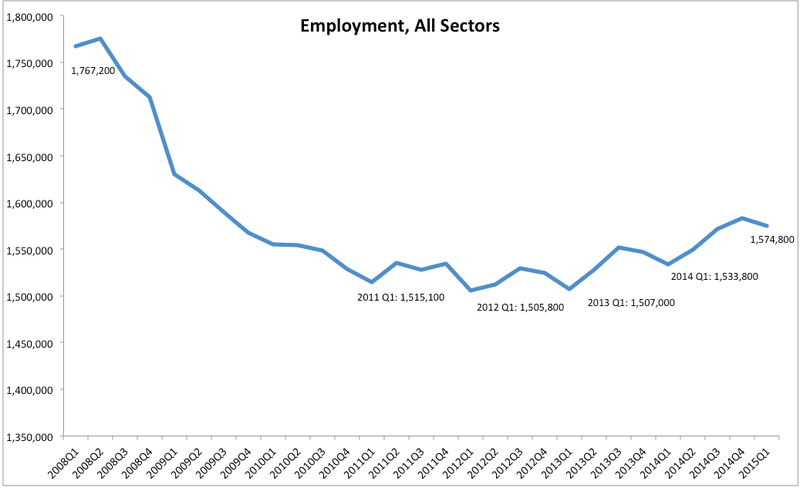 And this represents an increase of only 1,800 (+3.1%) y/y, and a drop on 1Q 2008 levels of 5,000 jobs. Another category of 'smart'/'knowledge' workers is Professional, scientific and technical activities. Here things are even worse. 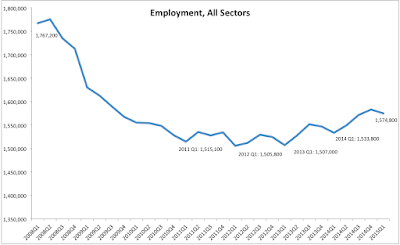 Total level of employment in this category at the end of 1Q 2015 stood at 79,000, which represents a drop of 5,100 y/y (-6.1%) and a decline of 2,600 on 1Q 2008. Overall, only two areas of activity have managed to post higher 1Q 2015 employment levels than 1Q 2015: Education (+3,900) as well as Human Health and Social Work (+19,000).